Writers, game designers, teachers, and students ~this is the book you've been waiting for! Written by storytellers for storytellers, this volume offers an entirely new approach to word finding. Find out more HERE. 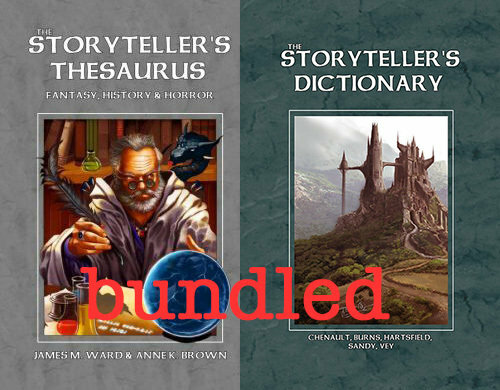 Like no other dictionary the Storyteller’s Dictionary breaks down and defines the words you need by subject matter. In this volume, you’ll find a host of useful words. Find out more HERE. Regularly $24.99 each, get them both for $39.98, a savings of $10! Prefer just one? You can do that too! Get the Thesaurus or Dictionary!